Rhizobium rhizogenes transformation is commonly used to generate transgenic roots traditionally called hairy roots, for both investigative and commercial applications. While fertile plants can be regenerated from transgenic roots, the transgenic roots are more typically used directly, either to investigate root biology or to produce valuable secondary metabolites. Hairy roots have been particularly useful for genetic studies of rhizosphere interactions; including the recognition of host plant roots by the roots of parasitic angiosperms. In this manuscript we analyzed various environmental, nutritional and procedural conditions for their effects on transformation of the model hemi-parasitic plant Triphysaria versicolor and Arabidopsis thaliana, one of its hosts. We first examined the effects of media, gelling agents and co-incubation times on Triphysaria root transformation and determined that while all three affected transformation rates, the media were the most significant. Once those primary conditions were fixed, we examined the roles of seedling age, explant type, acetosyringone, temperature and illumination on Triphysaria hairy root transformation rates. Using the optimized procedure approximately 70% of Triphysaria seedlings developed transgenic roots as judged by expression of YFP. These conditions were then used to transform Arabidopsis and similar transformation rates were obtained. Analyses of root transformation factors provides a method recovering transgenic roots from both parasitic plants and their hosts at high frequency. In addition to providing an effective in vitro approach for genetic investigations of parasitic plant-host plant interactions, these results are applicable to genetic studies of non-parasitic plants as well. Rhizobium rhizogenes (previously Agrobacterium rhizogenes ) is a soil born bacterium that infects dicotyledonous plants. The bacterium is chemotactically attracted to the plants by recognizing phenolic molecules, notably acetosyringone, that are released by wounded plants tissues . When R. rhizogenes contacts the wound site, it transfers and integrates a piece of its Root inducing (Ri) plasmid bearing root locus (rol) genes into the plant genome, resulting in the proliferation of multi branched, hairy roots at the site of infection . The transferred DNA encodes enzymes necessary for stimulating hairy root proliferation and, as has been done with Agrobacterium tumefaciens, provides a shuttle for introducing foreign genes into plants. Rhizobium rhizogenes transformed roots can be regenerated into mature fertile transgenic plants , but more commonly transgenic root cultures are used directly to produce desirable compounds or to study gene function [5, 6]. Root cultures provide a useful means for producing desirable molecules that are naturally made by plants and secondary metabolites have been isolated from hairy roots of over 150 plant species . For examples, the antimalarial drug artemisinin can be recovered from root cultures of Artemisia annua  and morphinan alkaloids can be recovered from cultures of Papaver orientale . R. rhizogenes is also used to transform foreign genes into roots in order to produce novel products not present in the targeted host plant, such as Nicotiana benthamiana roots that produce a tumor-targeting therapeutic antibody with a glycosylation profile similar to that of humans . In addition to metabolite production, transgenic roots have been extremely useful for investigating the biology of plant roots . This is particularly useful for investigations of root specific phenotypes where regeneration of mature, fertile plants is not possible or otherwise impractical . Transforming hairpin constructions that encode inhibitory RNAs have extended the utility of hairy root transformations [5, 13] and recently an atlas of tomato root tissues has been developed using R. rhizogenes . The ability to directly assay transgenic roots has been very useful to investigate the interaction of roots with other organisms, including nematodes , nitrogen fixing rhizobia , arbuscular mycorrhiza [17, 18], and parasitic plants, in particular root parasitic plants in the Orobanchaceae [19–21]. Parasites in the Orobanchaceae directly invade the roots of host plants to rob them of nutritional resources. The effects on the host can be debilitating and parasitic weeds are a significant threat to agriculture internationally . Parasitic plants attach to and invade host roots via parasite-encoded haustoria that develop in response to chemical and tactile cues from the host root and the development of haustoria and their infection into a host root can be monitored in vitro [23, 24]. We previously demonstrated that R. rhizogenes transformed Triphysaria roots form haustoria upon treatment with haustorial inducing factors and that these haustoria are functional and able to transport regulatory, hairpin generated RNAi molecules from host to parasite [25–27]. Similar results have been reported for the parasitic plant Phtheirospermum japonicum [20, 28]. The ability to generate transgenic roots of both host and parasitic plants has proven hugely advantageous for parasitic plant-host plant investigations [26–31]. However the frequency of root transformation using these procedures is rather low with only about 10–20% of seedlings yielding transgenic roots [19, 20]. In order to effectively exploit parasitic plant root transformation to explore the function of large numbers of candidate genes identified through genomic approaches, a more efficient transformation procedure is necessary. In this paper we examined several factors that affect root transformation of two species, Triphysaria versicolor, a model hemiparasitic species for parasitic plant investigations , and Arabidopsis thaliana, one of its hosts . Under the optimized conditions about 70% of both Triphysaria and Arabidopsis seedlings developed transgenic roots. The ability to generate transgenic roots at high frequencies provides a rapid and effective means to manipulate both the host and parasitic partners in this root–root interaction. A three factor experiment was performed to evaluate the relative merits of co-incubating the seedlings and bacterial cultures in different media (MS or 0.25X Hoagland’s), different gelling agents (Phytagel or Phyto agar), and for different co-incubation periods at 16 °C (1 or 2 weeks). As seen in Table 1, transformation efficiencies were significantly associated with all three factors. Since the interactions among the factors were significant, the specific effect of each factor on the transformation efficiency was evaluated. The MS medium resulted in higher transformation efficiencies than Hoagland’s regardless of solidifying agent or co-incubation times (Table 1, Additional file 1: Fig. S1A–B). Phytagel led to higher transformation rates than Phyto agar in both media and co-incubation periods (Additional file 1: Fig. S1C–D). Two weeks of co-incubation was significantly better than 1 week in MS medium but the time of co-incubation had no significant effect in Hoagland’s medium (Additional file 1: Fig. S1E–F). Three weeks of co-incubation did not further increase transformation rates (Table 2). Co-incubation in dark has positive impact on transformation efficiency in some species . However for Triphysaria, co-incubation in 24 h darkness resulted in fewer YFP expressing roots than maintaining the plants in a 12 h light/dark cycle (Table 2). The inclusion of 3% sucrose in the media increased transformation rates significantly (Table 2). Transformation rates were not further increasing in media with 4% sucrose and R. rhizogenes more rapidly overgrew the seedlings, therefor 3% sucrose was considered optimal. Acetosyringone added to the media to induce the vir genes in R. rhizogenes and increase transformation rates. We assayed three concentrations of acetosyringone, 0, 200 and 400 µM, freshly added into the co-incubation plates. Increasing concentrations of acetosyringone were beneficial for transformation and its absence resulted in very low transformation rates (3%) (Table 2). The age at which the seedlings were inoculated with MSU440 affected transformation rates with younger explants being more successful than older (Table 2). In some systems, inoculating root tips produced higher transformation rates than inoculating hypocotyls . But co-incubating Triphysaria root tips with R. rhizogenes produced very few YFP expressing roots (Table 2). A recurring problem affecting hairy root transformation is the overgrowth of seedlings with R. rhizogenes. Effective transformation is a balance of conditions that allow for the bacteria to infect and transform the seedlings but not overgrow the seedlings and media. The co-incubation conditions relevant to bacterial overgrowth include media, temperature and time of co-incubation. Bacterial overgrowth was particularly problematic in Hoagland’s mediums and MSU440 could overgrow Triphysaria seedlings after 3–5 days. In contrast, MSU440 did not overgrow seedlings in MS medium until 12–14 days of co-incubation. The rapid growth of R. rhizogenes following co-incubation in Hoagland’s was a key factor in the reduced transformation rate compared to MS medium. However 0.25X Hoagland’s is a better medium for Triphysaria growth . Therefore, we evaluated the effect of co-incubating the seedlings with MS for 2 weeks and then transferring them into either fresh MS medium or 0.25X Hoagland’s. After 8 weeks, there were a similar number of transgenic calli in both media but the total number of roots, their lengths and ultimately the transformation frequencies, were higher after transferring to Hoagland’s media than keeping the plants in MS after co-incubation (Table 3). In our previously published method Triphysaria seedlings were shifted to 24 °C after co-incubation with R. rhizogenes at 16 °C. To test the effects of this temperature shift, seedlings were co-incubated with MSU440 at 16 °C for 2 weeks, transferred into fresh Hoagland’s plates and then incubated either 24 or 16 °C. While the total number of roots was higher and their growth rates faster when plants were shifted to 24 °C, the number of YFP roots per plant was the same as when maintained at 16 °C (Table 4). Therefore the transformation efficiency was significantly higher when Triphysaria were maintained at 16 °C following co-incubation (Table 4). We next examined the effects of some of these modifications on Arabidopsis hairy root transformation, as previously described by Limpens et al. . One of the most profound parameters affecting transformation rates was the age of the Arabidopsis seedling at inoculation; inoculating 2-day-old Arabidopsis seedlings resulted in about 70% of them having transgenic roots while the same protocol using 10-day-old seedlings barely produced any transgenic roots (Fig. 2). As with Triphysaria, younger seedlings resulted in higher transformation efficiencies. We also evaluated Arabidopsis transformation efficiencies with different times of co-incubation at 16 °C and with or without a subsequent shift to 25 °C (Table 5). Unlike Triphysaria, Arabidopsis performed poorly with extended periods of time at 16 °C. Subsequent growth at low temperature also had a negative impact on transformation efficiency of Arabidopsis. The data suggest that there is an interaction between these two factors (Table 5). Under the optimized conditions, transgenic calli expressing YFP were apparent within 7 days of transformation (Fig. 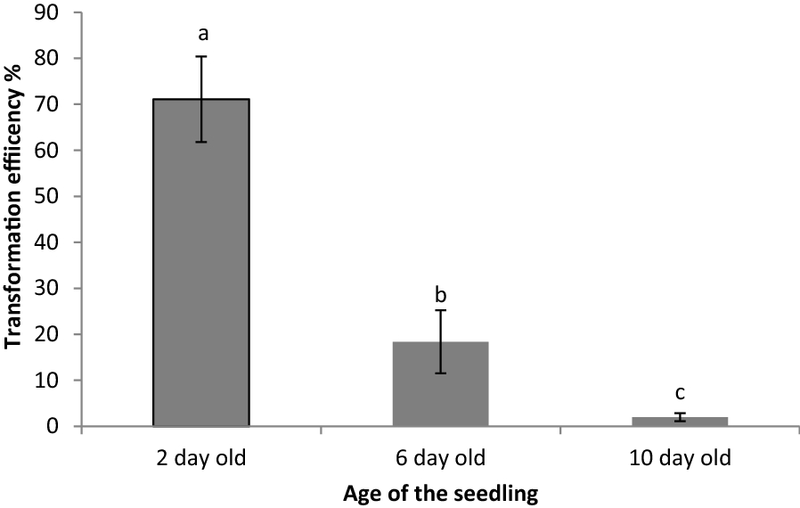 1i, j) and YFP expressing roots appeared within 14 days (Fig. 2k, l). The Arabidopsis transformation efficiency reported here is considerably higher than that of the previously published method . We used PCR to confirm transformation. We used primers that selectively amplify genes present on the T-DNA and incorporated into the plant genome. 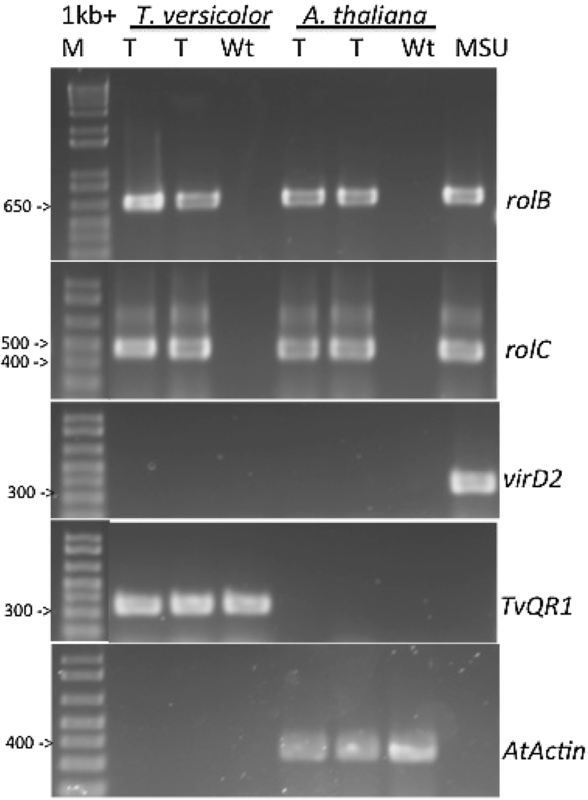 We also used primers that selectively amplify vir genes as control against contaminating R. rhizogenes because vir genes do not integrate into the plant genome . Triphysaria TvQR1 gene and Arabidopsis actin gene were used as a positive control for amplification of plant cDNA. The cDNA from wild type roots and genomic DNA from R. rhizogenes MSU440 were used as negative and positive controls. Figure 3 shows that the rolB and rolC genes, but not virD2, were amplified from the YFP expressing transgenic roots, indicating that rolB and rolC are incorporated into the plant genome. This paper describes the optimization of R. rhizogenes transformation of the root parasitic plant Triphysaria and its host Arabidopsis. The two optimized procedures are slightly different and summarized below. Five-day-old Triphysaria seedlings were inoculated with MSU440 and placed onto plates with MS medium, 3% w/v sucrose, 400uM acetosyringone and 0.2% Phytagel. Seedlings were co-incubated for 14 days at 16 °C at which time there were transferred to 0.25X Hoagland’s medium with 300 mg/L timentin, 0.75% sucrose and 0.8% Phyto agar. The freshly plated seedlings were returned to the 16 °C incubator and after 8 weeks about 60% of the Triphysaria seedlings had at least one YFP expressing root. Two-day-old Arabidopsis seedlings were inoculated with MSU440 and placed onto plates with MS medium, 3% w/v sucrose, 400uM acetosyringone and 0.2% Phytagel. Seedlings were co-incubated for 3 days at 16 °C at which time there were transferred to 0.25X Hoagland’s medium with 300 mg/L timentin, 0.75% sucrose and 0.8% Phyto agar and incubated at 25 °C. About 70% of the Arabidopsis seedlings had one or more roots ready to assay with 21 days of transformation. The R. rhizogenes strain MSU440 contains the root inducing plasmid pRiA4 . MSU440 was transformed with the T-DNA based vector pHG8-YFP which expresses the Yellow Fluorescence Protein (YFP) as a visual marker for transformation . Triphysaria versicolor seeds were collected from an open pollinated population growing south of Napa, California. Arabidopsis thaliana Columbia seeds were obtained from the Arabidopsis Biological Resource Center (https://abrc.osu.edu/). Hoagland’s medium was used at quarter strength (0.25X) and was prepared in the lab. Murashige and Scoog medium with vitamins (M519) was purchased in powder form from Phytotechnology Laboratories (Shawnee Mission, Kansas) and used at full strength. The composition of both media are shown in Additional file 2: Table S1. Media were solidified with either 0.2% Phytagel (Sigma) or 0.8% Phyto agar (Plant Media). Below are our optimized methods for hairy root transformation of Triphysaria and Arabidopsis. Several of these conditions were determined from the experiments described in this manuscript. A single colony of MSU440 was grown overnight in 1 ml of MGL medium containing 100 µg ml−1 spectinomycin (Additional file 3: Table S2). The bacterial culture was poured onto the top of a fresh MGL agar plate containing spectinomycin and 400 µM acetosyringone. The plate was incubated overnight at 28 °C until a creamy bacterial lawn developed on the plate. Triphysaria seeds were surface sterilized by treating with 70% ethanol for 10 min, 50% hypochlorite and 0.2% Triton X-100 for 30 min and washed eight times with sterile distilled water. Seeds were then plated on 0.25X Hoagland’s medium supplemented with 0.75% (w/v) sucrose and 0.6% (w/v) Phyto agar and vernalized at 4 °C for 3 days before being transferred to 16 °C to germinate under about 11 µmol s−1 m−2 photosynthetically active radiation (PAR). Arabidopsis seeds were surface sterilized by shaking for 5 min in 2% hypochlorite (commercial bleach) followed by washing with sterile water. Arabidopsis seeds were plated on MS medium supplemented with 1% sucrose and 0.6% Phytoagar, vernalized at 4 °C for 3 days, and transferred to 25 °C to germinate 30–461 µmol s−1 m−2 PAR. Roots of 5-day-old Triphysaria seedlings or 2-day-old Arabidopsis were excised by making a sharp cut with a scalpel at the root-shoot junction. The cut surface of the hypocotyl was inoculated by dipping onto the agar plate containing the lawn of MSU440. The inoculated seedlings were placed in three rows, each row containing 15 plants, on square petri dishes containing MS medium supplemented with 3% (w/v) sucrose, 0.2% Phytagel and 400 µM acetosyringone. The inoculated seedlings were co-incubated with MSU440 at 16 °C with 12 h light at 50–86 1 µmol s−1 m−2 PAR; Triphysaria seedlings were co-incubated for 2 weeks and the Arabidopsis seedlings were co-incubated for 3 days at 16 °C. After co-incubation, both Triphysaria and Arabidopsis seedlings were transferred to fresh 0.25X Hoagland’s plates containing 0.75% sucrose and 300 mg/L timentin (Plantmedia, USA) to reduce R. rhizogenes growth. Triphysaria seedlings were returned to the 16 °C incubator but Arabidopsis seedlings were shifted to 25 °C for further root development. 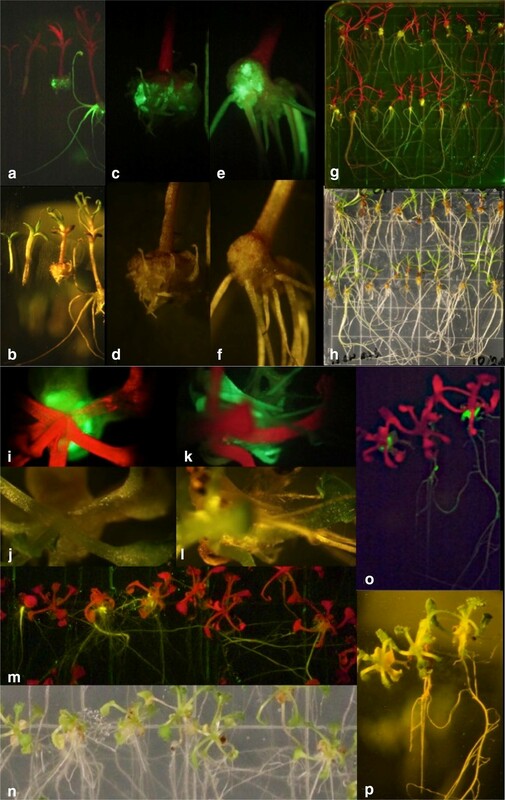 In Triphysaria, transgenic calli were identified 4 weeks after co-incubation and transgenic roots 8 weeks after co-incubation by visualization of YFP fluorescence (Fig. 1a–h) under a Zeiss Stemi SV11 dissecting microscope furnished with an YFP filter set with excitation HQ500/20, dichroic beam splitter Q515LP, and emission HQ535/30. Images were captured with a mounted camera. In Arabidopsis, transgenic calli were identified within 7 days after transformation and transgenic roots in 14 days (Fig. 1i–p). The transformation efficiency was calculated as the number of plants per plate with at least one root expressing YFP. Each plate was a technical replicate and containing between 35 and 50 seedlings, and each experiment consisted with three plates. Each experiment was a biological replicate and repeated two additional times. Data were analyzed with either the General Liner Model (Proc GLM) or the t test using the statistical analysis software, SAS 9.2 (SAS Institute Cary, North Carolina). Total RNA was extracted from roots using Qiagen RNAeasy mini kit including the in-column DNAase treatment. The quality and quantity of RNA was determined with a NanoDrop spectrophotometer and by electrophoresis through a 1% agarose gel. We reverse transcribed 0.5 µg RNA using the Superscript III First-Strand Synthesis System (Invitrogen, Carlsbad, CA) and oligo (dT)20 primers and used the cDNA as template for PCR. Two sets of primers amplified sequences on the T-DNA that is transferred into the host; one set amplified a 625 bp fragment of the R. rhizogenes rolB gene and one a 422 bp fragment of the rolC gene. A third set of primers amplified a 338 bp fragment of the virD2 gene which is not transferred into the host to control for bacterial contamination. Primers specific for the Triphysaria QR1 gene and the Arabidopsis actin gene were used as controls for endogenous plant genes. Primer sequences are shown in Additional file 4: Table S3. All PCR reactions were performed with Taq DNA polymerase (Invitrogen) using 35 cycles of 94 °C for 90 s, 55 °C for 30 s, 72 °C for 90 s, followed by a 10 min extension at 72 °C. PGCB designed and conducted the experiments and wrote the first draft. JIY advised in the design, helped analyze the data and wrote the final draft. Both authors read and approved the final manuscript. The authors wish to acknowledge thoughtful discussion with Yaxin Wang, Daniel Steele, and our colleagues on the Parasitic Plant Genome Project. All data generated or analyzed during this study are included in this published article [and its supplementary information files]. Our collection of plant materials comply with institutional, national, and international guidelines. This research was supported by awards DBI-0701748 and IOS-1238057 from the NSF’s Plant Genome Research Program. 13007_2018_327_MOESM1_ESM.docx Additional file 1: Figure S1. Contribution of individual factors on transformation efficiency. The contributions of individual factors on the efficiency was compared using GLM procedure sorted by each factor followed by Tukey’s Studentized Range (HSD) Test. A–B: Media combinations, C–D: Solidifying agent. E–F: Co-cultivation duration. 13007_2018_327_MOESM2_ESM.docx Additional file 2: Table S1. Plant growth media composition. 13007_2018_327_MOESM3_ESM.docx Additional file 3: Table S2. Bacterial growth medium (MGL) composition. 13007_2018_327_MOESM4_ESM.docx Additional file 4: Table S3. Sequences of primers used for PCR.